"They (Contractors) found the drive-in design and layout too unusual, so they didn't want to touch it. We ended up doing the sitework ourselves." To create the large screen towers, he employed an architectural method familiar to the farming region. "We built a lot of towers the same way as grain elevators using the slip form method. We would pour concrete into a slip that was about 6 feet high. And then we would add another on top of that. That's how it went from the ground up." Corgan also had to develop a road design that didn't cause traffic jams while customers waited to enter the drive in. 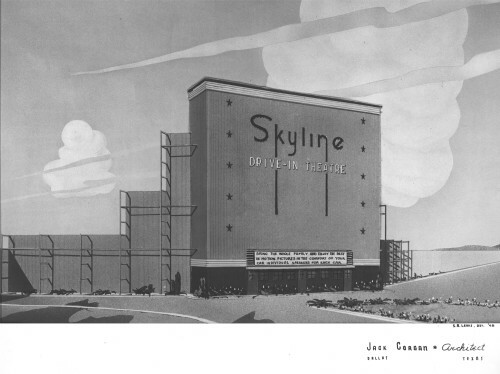 "Ideally, a piece of property for a drive-in was 15 acres or more shaped like a rectangle. Our goal was to have enough space for 30 or 40 cars without backing up the traffic on the main road, or having a at fault driver causing damages. But sometimes that wasn't possible, because the property we built on was too small or irregularly shaped." By the time Corgan retired in 1980, he had over 75 drive-in theaters to his credit throughout the southwest.